Discussion in 'The Garage' started by AZ Mark, Feb 20, 2015. Have been reading the HF table thread and decided to do one the old fashioned way. Using whatever was around. 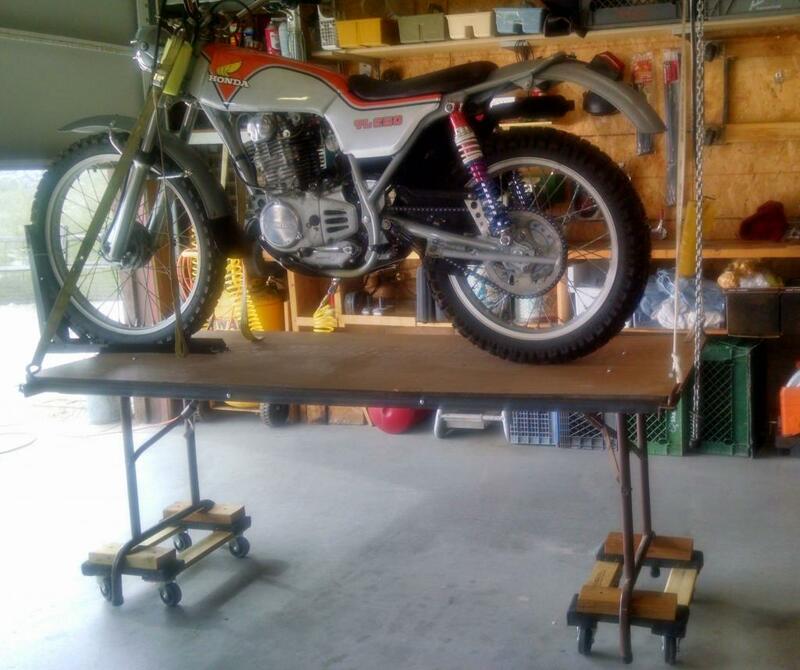 A table is pretty much a table just need a wheel stabilizer. Oh yes... a lift mechanism! Thought about this all week. Have a old beat-up, bent, shop table. Needed a little TLC and some extra supports that extended past the table edge for lift/ anchor points. Here it is ready for the first lift, wheel chock I had lying around, yes I meant to extend it over the front... Little mule tape and chain hoist. Raised the front first then the rear... should have taken another pic or two but kinda in a hurry the first time with my TL hanging in the balance! As I said before.... Too much extra time on my hands. However this project will likely see some use. 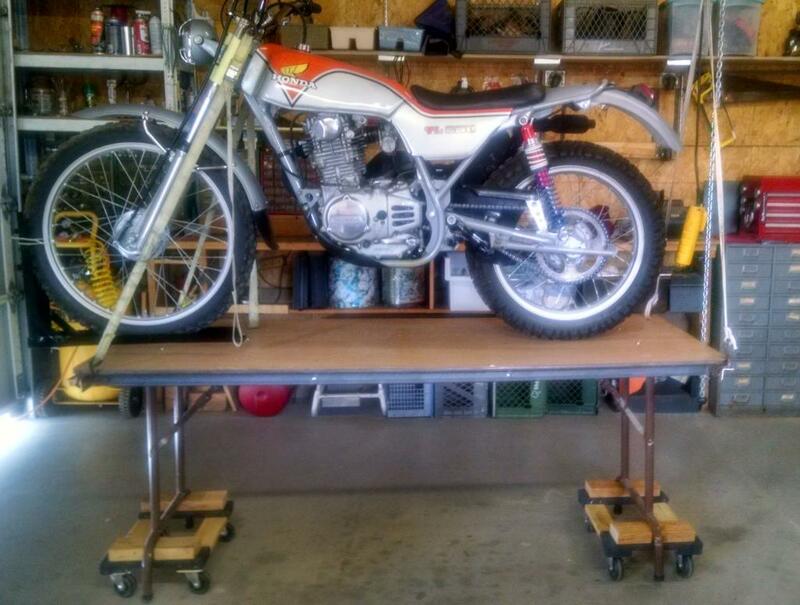 I'll load the XR400 someday soon. 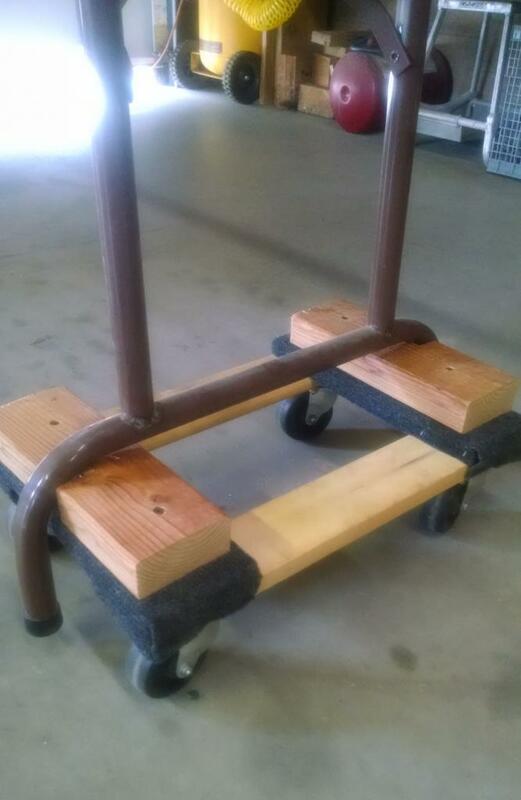 As it sits it is much more stable (actually very stable) than I would have imagined while on wheels. Upon further review, slightly less sketchy, but I applaud your resourcefulness. 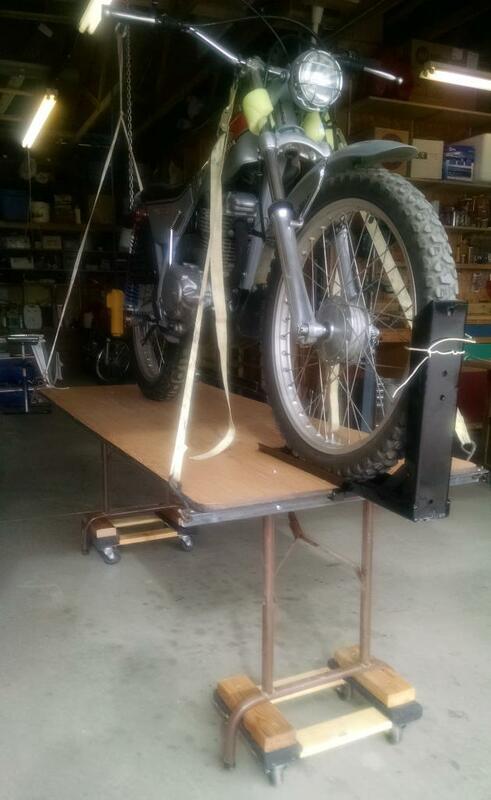 That'll do donkey, that'll do....so long as your lifting small bikes like that. Good job being bored! BADDAD " Bitter Clinger "
Bonus points for proper use of a cool motorcycle. Let me guess- any screws used were square drive, correct? The base looks kind of narrow, and know with all eight wheels swiveling, any four on either side could tuck under and the table would fall to that side. When you're laying in bed some night and hear a loud crash at least you'll know what it was. I have seen it happen with 2 people sitting on one, at a wedding. I don't know that I would put anything heavier than that Honda on it. That will get her up there where you can work on it! Cool. Nice work, but I think you're going to find that the height is way too high for anything other than work directly underneath the bike. I have a factory lift and it doesn't go nearly as high as yours and for 75% of work, it's too high. I'm selling my lift (moving and I don't want to move the brute). Rather than buy another one, I'm also going to try and improvise something in my next house but it won't go very high - perhaps up 16" or so. Yea, he is gonna need a step ladder to change the spark plug. Being able to move the lift up and down as needed is very handy. + 1 on this. Depends on what you're working on, of course, but i think that will be too tall for most work. I have a couple of beat up banquet tables in my garage too and i love them for spreading out a big project, like a motor build. I use the furniture dolly under the legs too, but only on one end, so i can move it out of the way when I need to by picking up the non-wheeled end like a wheelbarrow. Setting it down on two fixed legs adds a considerable amount of stability. Cogswell Road Captain, Hell I'm a Road General. I have seen it happen with 2 people sitting on one, at a wedding. I don't know that I would put any bike that I really cared about on it. 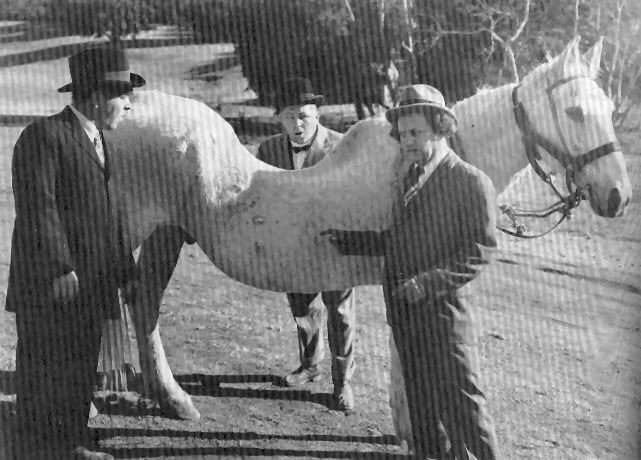 I've got that table's brother on my back porch - it's developed a sway back like a 40 year old horse, and no one's even sat on it. 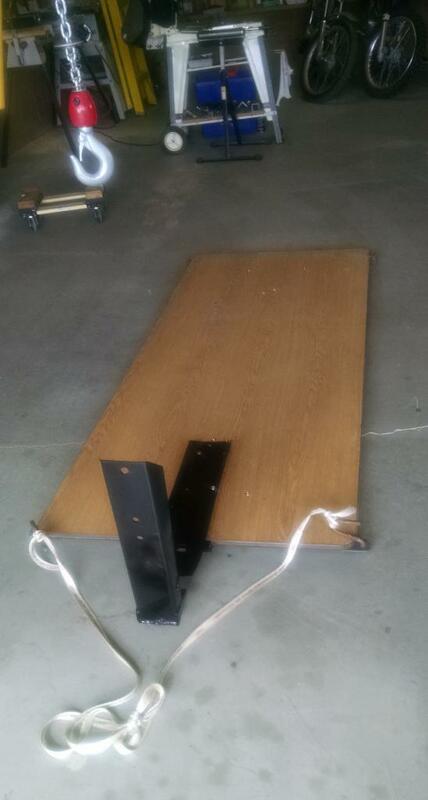 I also have a "Skid Plate" hydraulic lift that has a max raise of 24". The TL is short so likely no issues with being too high for most work. However the XR4 will be another story! Used all my square head screws years ago... Ya got any extra's ? I'm rather certain the !/8 by 1.5" angle iron frame will hold the weight. The Legs mounts are now bolted (not screwed into particle board). Legs have been re-welded at all joints. However the foot of the legs are weakest point. But the rollers support point bypass that area. Roller's seem steady enough for me to roll the 40' to the back of the shop if necessary. Usually will only roll 4 to 5 feet.